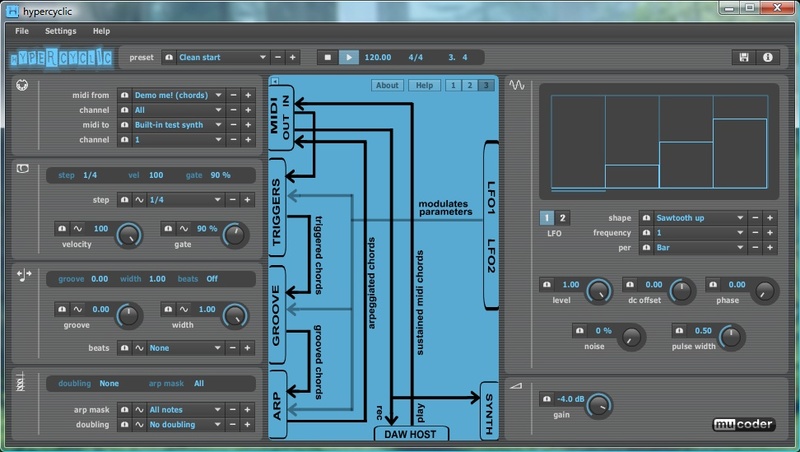 The hypercyclic is a MIDI Arpeggiator and Mangler from Mucoder. The hypercyclic will help you create multiple rythmic variations and modulate various synthesizer parameters, giving you unique and rhythmic sounds. With the hypercyclic, you can create MIDI patterns that you can send to other plugins or you can simply record. You can get a random sequence and a syncopated sequence and fit both into a rhythmic beat or measure. The hypercyclic can take your music to new heights as you can come up with glitchy stutter effects, experimental modulations, two tempo syncing with LFOs. You can also go for experimental rhythmic effects and chord variations. Same functionality but re-worked core based on tonespace 2 from Mucoder.